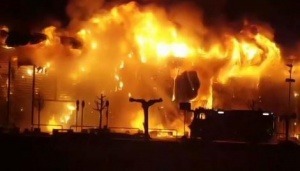 A fire has completely burned down a 60,000 square meter shopping center located in Oderzo, northern Italy. This shopping center, with dozens of shops, it is about 50 kilometers from Venice and was opened to the public in 2009. Fortunately, no one has been injured. The cause of the fire remain unknown. The enclosure was reduced to ashes and the firemen could only attend impotent to the destructive capacity of the fire. The fire was out of control and the flames reached such intensity that firefighters could not do anything to extinguish it. They just evacuated the area and waited for the flames to lose their strength. The images show a wall of flames that in a very short time engulfed the mall. Authorities must now work slowly between charred remainders and crumbling structures to find out the causes. There are many passive fire protection solutions that can help to prevent such a destruction. See Fire protection solutions in Shopping Malls.